Amid raging anti-globalisation and rising unilateralism and protectionism, people are wondering where the world should be going. Countries are looking to the upcoming G20 Summit in Buenos Aires, which will be the tenth ever held and the first one in South America, for an answer. In my opinion, G20 should and can play an important role in three areas. 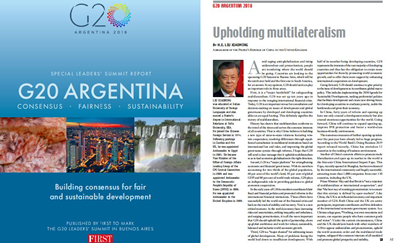 First, it is a “major battlefield” for safeguarding multilateralism. G20 was set up ten years ago in response to the ravaging international financial crisis. Today, G20 is an important venue for consultation and decision-making on issues of development and global governance by developed and developing countries alike on an equal footing. This definitely signifies the victory of multilateralism. History has shown that multilateralism conforms to the trend of the times and serves the common interests of all countries. That is why China believes in building a new type of state-to-state relations featuring win-win cooperation, resolving differences through equal-footed consultation in multilateral institutions based on international law and rules, and improving the global governance system through reforms. I hope that G20 will send a clear message that it upholds multilateralism so as to lead economic globalisation in the right direction. Second, G20 is a “major platform” for strengthening economic and financial governance. With its members accounting for two thirds of the global population, 60 per cent of the world’s land, 85 per cent of the global GDP and 80 per cent of world trade volume, G20 plays an indispensable role in providing guidance to global economic cooperation. In the early years of G20 its members coordinated their fiscal and financial policies and promoted reforms in the international financial institutions. These efforts have successfully led the world out of the financial crisis and back on the track of stability and recovery. Now is a new critical moment. As the world economy faces increasing risks and uncertainties, striking inequality and imbalance, and surging protectionism, it is all the more important that G20 should uphold the spirit of partnership, shore up global confidence and work for robust, sustainable, balanced and inclusive world economic growth. Third, G20 is a “major channel” for addressing issues of global development. Many of problems facing the world boil down to insufficient development. With half of its member being developing countries, G20 represents the interests of the vast majority of developing countries and thus has the obligation to create more opportunities for them by promoting world economic growth, and to offer them more support by enhancing international cooperation on development. Going forward, G20 should continue to give priority to the issue of development as it coordinates global macro policy. This includes implementing the 2030 Agenda for Sustainable Development, making preferential policies that facilitate development and creating new driving forces for developing countries to eradicate poverty, tackle the bottlenecks and grow their economy. In China, forty years of reform and opening up have not only created a development miracle but also created enormous opportunities for the world. Going forward, China will continue to expand opening up, improve IPR protection and foster a world-class business-friendly environment. The numerous measures of further opening up taken over the past year have already led to huge progress. According to the World Bank’s Doing Business 2019 report released recently, China has overtaken 32 countries in the ranking of business environment. Another of China’s concrete efforts to promote trade liberalisation and open up its market to the world is the first-ever China International Import Expo. This Expo, recently opened in Shanghai, has been welcomed by the international community and hugely successful, attracting more than 3,600 companies from over 172 countries, regions and international organizations, including the UK. It will become an annual event. Prime Minister May said that Brexit is “not a rejection of multilateralism or international cooperation”, and that “the best way of resisting protectionism is to ensure that this century is defined by open markets”. Like China, the UK is an influential economy and important member of G20. Both China and the UK are active participants, important contributors and firm defenders of the international economic governance system. As a Chinese adage goes, “Nothing, not even mountains and oceans, can separate people who have common goals and vision”. Under the current circumstances, China and the UK should join hands with other members of G20 to oppose unilateralism and protectionism, uphold the world economic order and the multilateral trade regime, safeguard the common interests of all mankind and promote global prosperity and stability.